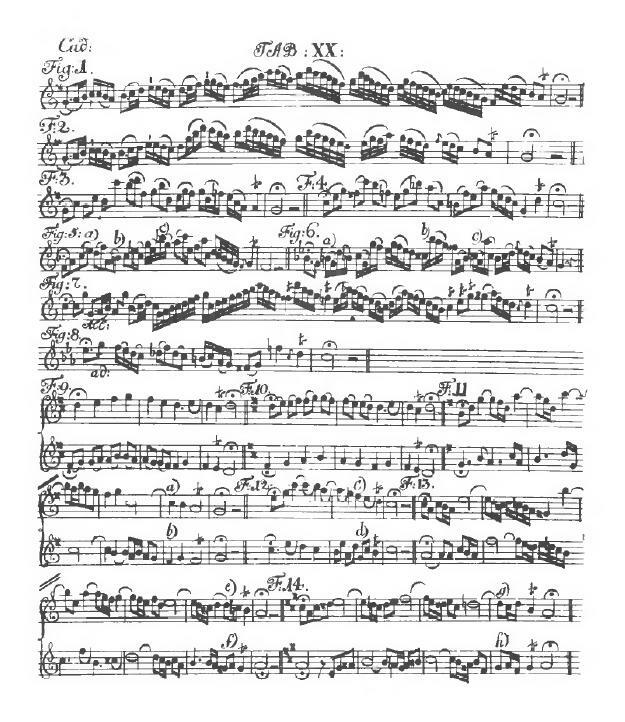 Quantz is nowadays of course most famous as author of the “Versuch einer Anweisung die Flöte traversiere zu spielen” (Berlin, 1752), the most thorough treatise on any instrument to date, and as flute teacher to Frederick the Great of Prussia. Fortunately, there appears more and more music of Quantz in concerts and on CD, so a broad audience can peruse his beautiful compositions. The “Essay of a Method of Playing the Flute traversiere” is in English published as “On Playing the Flute” (translated with notes and introduction by Edward R. Reilly). The essay is of great interest today as a valuable guide for contemporary musicians and has long been recognized as one of the primary sources of information about eighteenth-century performance practice. It contains valuable information on ornamentation and flute technique in the 18th century. With the comprehensiveness of his manual Quantz aimed for an all round educated musician: “Since I am endeavouring to train a skilled and intelligent musician, and not just a mechanical flute player, I must try not only to educate his lips, tongue, and fingers, but must also try to form his taste, and sharpen his discernment ……”. It is an exhaustive work that discusses nearly all aspects of performance, from ornamentation and accompaniment to criteria for evaluating compositions and musicians. Despite its title, less than a third of the book is intended specifically for flutists. The essay goes far beyond an introduction to flute methods by offering a comprehensive program of studies that is equally applicable to other instruments and singers. The work is comprised of three interrelated essays that examine the education of the solo musician, the art of accompaniment, and forms and styles of the time (French, Italian and German). Quantz provides detailed treatment of a wide range of subjects, including phrasing, ornamentation, accent, intensity, tuning, cadenzas, the role of the concertmaster, stage deportment, and techniques for playing dance movements. Of special interest is a table that relates various tempos to the speed of the pulse, which will help today’s musicians solve the challenge of playing authentic performance tempos in Baroque music. Part one: Introduction, Chapters: I. – XVI. The virtual flute method, subdivided in three sections . Chapters: I. – IX. Initiate the student in the fundamentals and the technique of flute playing. Chapters: XII. – XV. The advanced flute player is made familiar with the execution and the embellishments. Chapter: XVI. The coming soloist is informed about problems associated with his further carreer. Part two: Chapter: XVII. Vividly discribes the high standards of the Dresden Hofkapelle and its brilliant orchestral activities under the conductors Johann David Heinichen (1683 – 1729) and Johann Adolf Hasse (1699 – 1783). Part three: Chapter: XVIII. Quantz displays his aesthetic theories. In his aesthetic views Quantz completely subscribed to those of Johann George Pisendel (1687 – 1755). 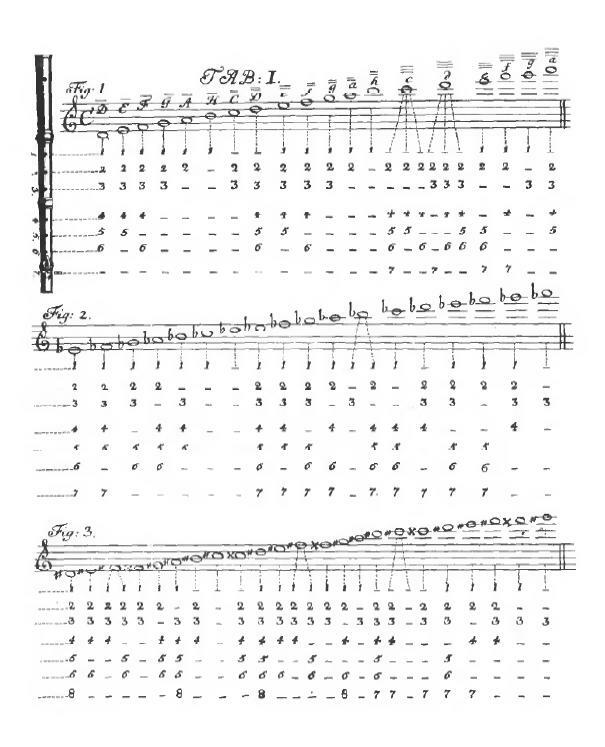 The tutor was written for the two-keyed flute that Quantz favoured and built, using separate fingerings for sharps and flats, but he gave only brief hints on how to use these keys as he was well aware that most of his readers used one-keyed flutes. His instructions on tonguing were by far the most sophisticated to date, including the technique of double-tonguing, which he was the first to mention in writing. The treatise was published in many countries and was reprinted many times.